The Cat Who Came For Christmas: was written by Cleveland Amory. The Cat Who Came For Christmas: was published by Bantam Books 1989. About Cleveland Amory (Author) : Cleveland Amory is a published author of children's books. 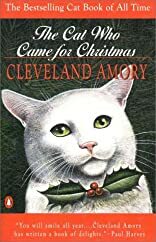 Some of the published credits of Cleveland Amory include Cat Who Came for Christmas, Best Cat Ever, Cat and the Curmudgeon.